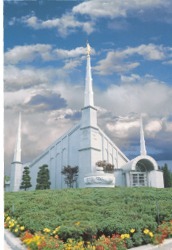 The Seoul Korea Temple is the 37th operating temple of The Church of Jesus Christ of Latter-day Saints. After the temple was dedicated, a subway system was built in conjunction with the Summer Olympics at Seoul in 1988. The system included a line that ended right at the base of the hill upon which the temple was built, making the temple even more accessible for Mormon Church members. The importances of families and one's ancestors have been a long tradition in Korea. Some families have kept records for hundreds, even thousands, of years. With the dedication of the Seoul Korea Temple, the submission of names for temple work to be done was phenomenal. One such family had submitted names from fifty generations. The Seoul Korea Temple has a total of 28,057 square feet, four ordinance rooms, and three sealing rooms. This page was last edited on 8 December 2011, at 13:37.